It's a familiar sight: Multicolored streaks of spray paint decorating a grassy lawn or a line of colored flags, making one wonder if the graffiti ultimately has a purpose or if utility workers have a little too much time on their hands. As it turns out, there is a very precise and high-tech GIS-based method to the madness behind all those rainbows of lines and foreign symbols. These markings on the ground are a direct result of the City of St. Cloud Public Utilities Department's one call locating efforts and the Gopher State One Call (GSOC) organization. GSOC is the one-call notification system established to notify Minnesota underground facility operators of planned excavation. The one call concept is simple: anyone in the State of Minnesota who will be digging contacts GSOC, who then sends the one call locate request via a digital ticket to the city, as well as other underground facility operators. Each ticket contains vital information about the future dig site: Address, contractor name and phone number, marking instructions, work-to-begin date, etc. Within 48 hours of an issued ticket, the city must "mark" underground utilities. To make the city's job even more tedious, the State of Minnesota passed new Positive Response legislation January 1, 2006, which states that all underground facility operators need to respond to service requests, regardless if they have underground facilities at the dig site or not. This means marking a dig site via paint, flags and/or providing a digital response to GSOC. With up to 200 one call service requests a day and implementation of Positive Response, the city needed an efficient, digital way to manage one call tickets in the field. Up until a few months ago, the city was receiving tickets via a fax system where staff was required to sort through each paper copy one-by-one. Not to mention, locators had to drive back to their offices to receive new tickets throughout the day. Without better management, the city knew it would cost thousands of extra dollars in paint/flag inventory and additional staff to comply with the new requirements. To address one call ticket management issues, the City of St. 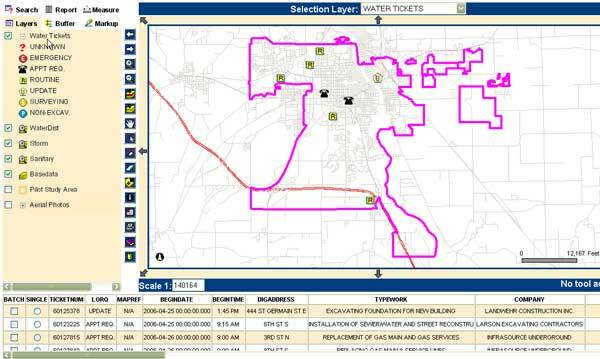 Cloud Public Utilities Department, in conjunction with Pro-West & Associates, developed a wireless, web-based One Call Ticket Management System (OCTM) that allows city locators to view tickets as points on a map and respond to service requests. The OCTM system, in an automated fashion, creates points representing dig sites in the web-based GIS application, WebFusion. The application is real-time, so when GSOC sends a ticket to the city, the locator can view it on their interactive web-mapping site, along with GIS data such as roads, parcels, utility infrastructure and aerial photography. Furthermore, the OCTM system is fully automated in-house, making it easy to manage for IT and administrative staff. Developing the OCTM system leveraged the city's current investment in GIS technology. Existing ArcIMS web mapping software, servers, GIS data, ArcView, intranet web mapping and a purchase of SDE and laptop computers completed the infrastructure to power this system. 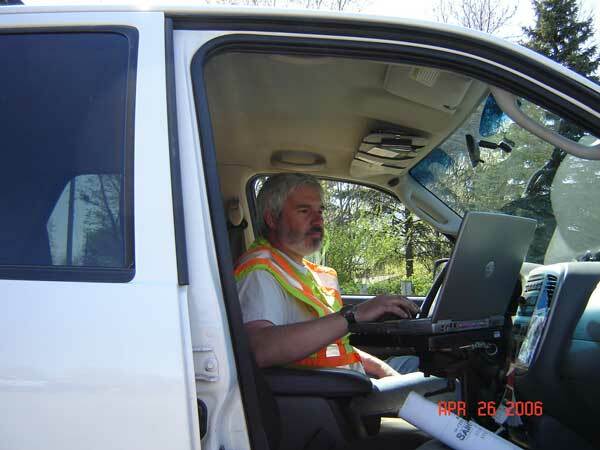 Locators are now equipped with laptops in the field where they use wireless technology to log on to the GSOC website allowing them to view and respond to service requests. This eliminates the a need to drive back to the office to view new tickets. They can evaluate tickets and plan or adjust their daily routes according to the results on the web-based mapping site. Some facilities, such as light and traffic, have tickets automatically filtered in ArcView so that only those ticket locations near light and traffic facilities are posted to the website, saving hours of time sorting through tickets. In addition, locator responses are entered once, via the web application, eliminating paper trails and redundant data entry. Locator responses are automatically sent to GSOC which posts the responses on a web-based ticket interface, where parties can view which facilities have been marked or cleared on their dig site. The OCTM system has an automated verification process as well. Daily emails are sent to appropriate staff that notifies them if tickets have not been received by the system. OCTM also verifies that locator responses are sent to GSOC. Using existing GIS and wireless technology and dedicated staff, the City of St. Cloud is increasing its level of public service, efficiently fulfilling Positive Response requirements and saving time and money executing GSOC requests. So the next time you see that organized, colorful graffiti outlining your neighbor's yard, remember, GIS probably isn't that far away.